Elizabeth's Bio: Elizabeth Barton has been writing stories for just about as long as she can remember. After attaining degrees in psychology and nutritional sciences, she began work as a medical writer and editor. She participated in the Writer’s Loft workshop in Chicago for more than four years and has recently begun seriously pursuing a career in fiction writing. Elizabeth has dozens of short stories in varying degrees of completion and is polishing a draft of her first novel. She lives in Chicago with her husband, Ian, and two cats, Roxie and Gordon. When she is not writing, Elizabeth is an avid reader and enjoys travel, theater, and wine. She also loves to dabble in, but never master, various pursuits including drama, sewing, painting, ceramics, and stained glass work. She believes that every experience can be an inspiration. 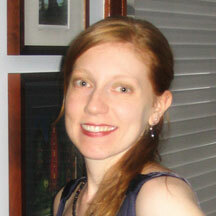 She recently won third place in WOW’s spring flash fiction contest for her story, The Wedding March. If you haven't done so already, you should definitely check out Elizabeth's prize-winning story "Not Tonight." When you've finished reading, return here for a chat with the author. WOW! : Congratulations on placing in the 2009 Summer Flash Fiction Contest! You have managed to pack so much emotion into your piece of flash fiction. Do you believe it’s easier or more difficult to create such vivid feelings under the constraint of a small word count? Elizabeth: Honestly, neither. I think that one can create vivid feelings in a sentence or two. Of course, it's harder to create a character with depth and tell a complete story when you have word count restraints. On the other hand, it's hard to maintain the intensity you often get with flash fiction when writing longer pieces. WOW! : Yes, I agree. Despite the word count restraints of this contest, I think you have done a fantastic job of creating a complete story with meaningful characters. In your bio you say that every experience can be an inspiration, and I completely agree. Can you describe or give an example of how some of your other artistic endeavors have inspired your writing? Elizabeth: I can't think of any specific instances where my other artistic endeavors have directly inspired me in my writing. It certainly could happen, though. For now, I find that it those endeavors allow me to create in a different way. I don't have to think about ceramics or painting in the same way I have to think about writing, so my mind can sort of relax. WOW! : As an avid reader, I'm sure you’re in the middle of reading at least one (if not two or three) books right now. Are you reading anything interesting? Which writer or story has most influenced your writing? Elizabeth: Right now, I'm reading Timeline by Michael Crichton, which has an interesting mix of science and history; plus, I've always been a sucker for a time travel story. My all-time favorite book is Slaughterhouse Five by Kurt Vonnegut. Although I enjoy both Crichton and Vonnegut, I wouldn't say my writing really resembles either of them. It's hard to pin down one particular author or story that's influenced me most, but I'd list Michael Chabon, Nick Hornby, David Sedaris, and A. Manette Ansay among my influences. WOW! : I know, it’s difficult to pin down just a few influential writers because inspiring or helpful attributes can be found in so many pieces of writing. In your interview after winning 3rd place in the WOW! Spring 2009 Flash Fiction Contest, you spoke about working on revisions to your novel. How is your novel progressing? Have you had any breakthroughs or run into any roadblocks? Elizabeth: No, there haven't been any breakthroughs or roadblocks. I'm making steady progress, but it's always slower than I would like! WOW! : Yes, I know what you mean! When I'm excited about a writing project, it always seems to progress slower than I’d like. What do you enjoy most about writing? Elizabeth: I just love seeing what happens when I start writing. There's stuff I never knew I had in me that ends up on the page. Also, when I start a story, I rarely know where it's going to go. Just like with reading, I like writing to see how the story ends. WOW! : Thank you, Elizabeth, for your time, your insightful answers, and your impressive piece of flash fiction. We wish you the best of luck with your writing in the future! Is there a link to the story "Not tonight" -I can't seem to find it! I located it on the WOW! contest page. Toward the bottom, there are links for past contests. Gotta get off the computer now and get the kids their breakfast before school!